It's a super sticky affair, but if you own a stand-mixer, I think it's worth making at least once in your life. You'll see the difference between commercially-made marshmallows instantly—a more subtle, natural vanilla taste and a luxuriously creamy texture. Dip them in a little melted dark chocolate and they make a beautiful gift wrapped in little plastic bags! Sift together confectioners’ sugar and cornstarch in a bowl. Set aside. 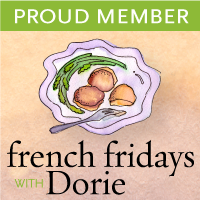 Lightly butter, or spray with a nonstick vegetable spray, the bottom of a 13 x 9-inch baking pan. Line the bottom of the pan with parchment paper. Then sift about 3 tablespoons of the confectioners' sugar mixture onto the bottom and sides of the pan, tapping out the excess. Set aside. Meanwhile, in a heavy two-quart saucepan, place the sugar, corn syrup, salt, vanilla seeds, and remaining 1/2 cup cold water. Stir over medium heat until sugar dissolves and the mixture comes to a boil. Cover the saucepan with a lid and let boil for about two minutes to allow any sugar crystals to dissolve from the sides of the saucepan. Remove the lid and attach a candy thermometer to the side of the pan. Increase heat to high and boil, without stirring, until the syrup reaches 240°F, about 10 to 15 minutes. Remove from heat. Scrape marshmallow mixture into the prepared pan and spread with a damp offset spatula or rubber spatula. The mixture is very sticky so just smooth it out as best as you can. Dust the top of the marshmallow with 1/4 cup of the confectioners' sugar mixture and let stand, uncovered, at room temperature until set, about 12 hours. Remove the marshmallow from the pan by first running a small sharp knife around the edge of the marshmallow to loosen it from the pan. Invert the pan onto a large cutting board that has been dusted with the confectioners' sugar mix. You might have to use your fingers to help loosen the marshmallow from the pan. Peel off the parchment paper (the marshmallow will be sticky) and dust the top of the marshmallow with the confectioners' sugar mixture. 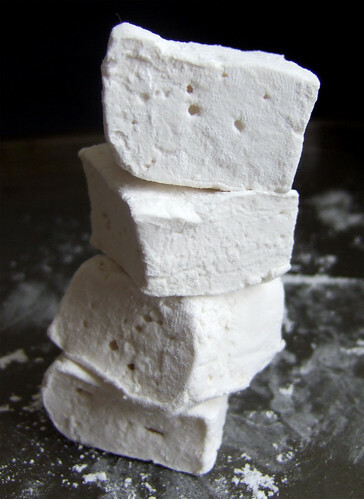 Cut the marshmallow into roughly 1-inch squares using clean kitchen scissors, a pizza roller or a sharp knife. Dip the cut sides of the marshmallows in additional confectioners' sugar mixture. Shake or tap off excess sugar and store the marshmallows in an airtight container, at room temperature, for up to two weeks. 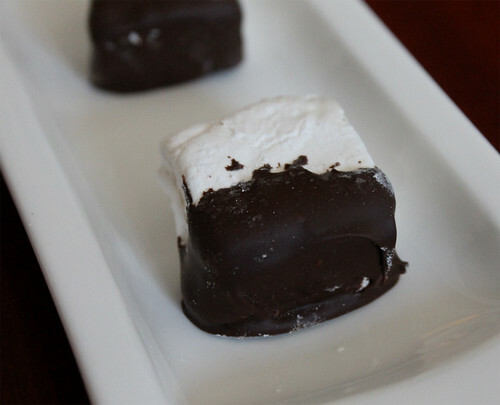 If desired, dip the marshmallow squares in melted chocolate, place on a sheet of parchment paper, and let the chocolate set before storing them in an airtight container in between sheets of parchment paper. Posted by Bonita at 1:02 p.m.
@Mango_Queen December 11, 2011 at 9:16 p.m.
Oh my goodness, I love Marshmallows! Can't wait to try this recipe! Thanks for sharing. Happy Holidays! Mardi @eatlivetravelwrite December 12, 2011 at 6:48 a.m. The only time I have ever made marshmallows they were delicious but a sticky mess. Yours are so neat and clean. Gorgeous!